Capacities from 140 to 2,800 pounds. 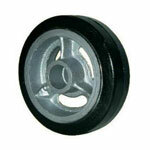 MD Wheel Type - Mold-on rubber on a die cast aluminum core available in 2" wide wheels only. MR Wheel Type - Mold-on rubber on a cast iron core. Seals - All wheels that have 1-3/16" bore and either a 1-5/8" or 2-3/16" hub length equipped with 3/4" straight roller bearings have as a standard feature nylon seal retaining/thrust washers which add 3/16" to hub length and are supplied with 1/2" ID hardened spanner bushing. Lubrication - Wheels with 2-3/4" or longer hub length have zerk fitting in hub with the exception of 6" x 3". Wheels with 1-5/8" or 2-3/16" hub length are normally lubricated through hollow axles. When specified, zerk fittings can be furnished on most of these wheels with the exception of the 3-1/4" diameter. Hardness - 60-80 durometer Shore A. *Wheels are complete with spanner bushing and nylon seal retaining thrust washers.